Upon waking to an early morning view of a wall of fire surging over the closest mountain ridge raging towards my residence by Creek Road, Saddle Mountain, I left calmly, unattached to outcome with a prayer to accept all as God’s Will and a small suitcase filled with important files and computer hard drives. Days later, seeing the online fire map, drawn through my belongings, I felt a release of burden, a lightness, thinking all of my stuff had perished. But then I heard the news of twenty-five horses perishing in the Creek fire and I received a powerful insightful vision of "Red Thunder”. A dense column of white smoke, the sound of the stampeding chaos; the equine surged to breathe, escape and their spirits ascend as ridges of fire blazed in dense darkness. The funnel shape in mind was similar to an urn I saw on one of my travels and I searched through all of my photos and finally found the image on my iPhone from a visit to the Barcelona Museum, May 21, 2016. I scrolled to the next photo to see the label “Dione Renart”, (Barcelona, 1878-1946) Vase with female figure. Then I scrolled to the very next photo after the label and to my surprise was Picasso’s drawing of “Gored Horse", sprawling splayed front legs with its neck stretched up and nostrils towards the heavens as if to be taking it’s final breath. Shockingly, it was a confirmation, meant to be, to create “Red Thunder”. 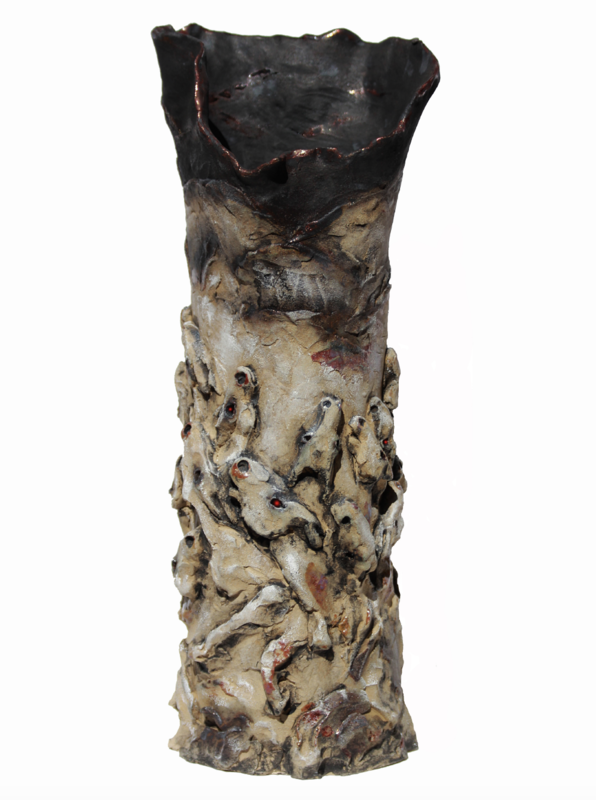 I created the cylinder of clay with the sculpted relief of 25 horses, all with an eye piercing through the wall of the cylinder. The top of the cylinder, the vision was dark black with ridges of lustre copper glazes, mimicking the Topa Topa Mountains and the surrounding ridges of Ojai Valley on fire at night. I collected Thomas Fire Ash and mixed it with the clay and glazes. I wanted a smoldering smoke/steam to permeate from within and glow red lights. With research, I came across an aroma therapy vaporizer with lights to boot! Next was the sound, I combined from youtube sound tracks of a fierce crackling fire and another track of horses stampeding and neighing. You may view a complete video of the sculpture installation in darkness with the full effects of sound, steam and red lights on youtube, which can be found by googling "youtube “Red Thunder” Valerie Freeman”. 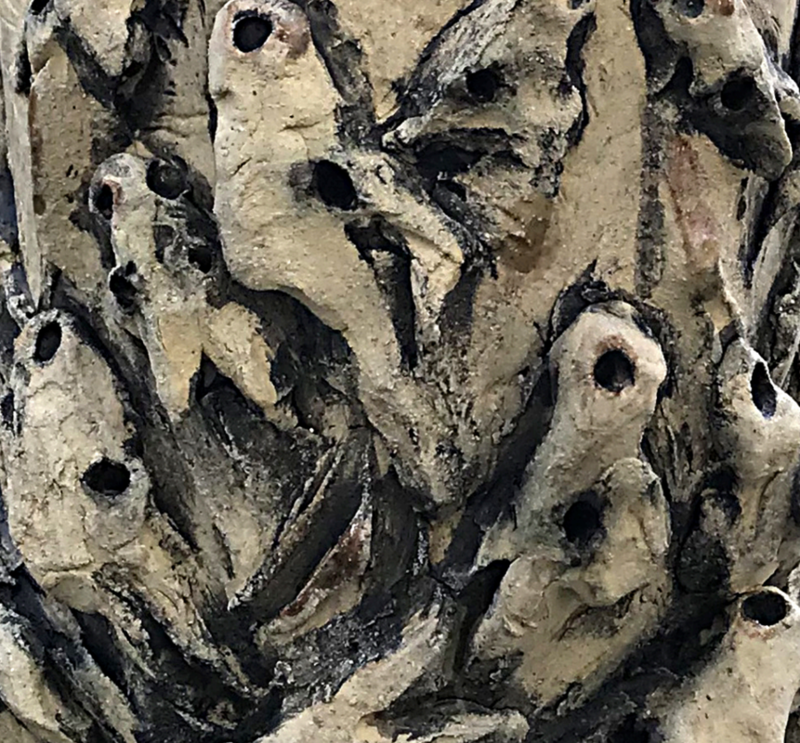 For the complete installation, my intention is to have Ojai’s orange blossom essential oil in the diffusor as a therapeutic means for the viewers who may rekindle emotional trauma while viewing the sculpture . The orange blossom aroma would calm their nerves and bring a sense of safety and peace while they experience the horror and grief captured in “Red Thunder”.